For those days when it’s just a bit cooler, you may want to reach for this Lightweight Fleece Hoodie. Customers love how they can throw it on and zip it up as high as they need to give themselves just a little more warmth. Are you looking for durable work-wear that will keep you warm on the job without getting in your way and preventing you from working comfortably? Contractor’s Solutions is excited to offer you a practical assortment of durable, comfortable hooded sweatshirts to keep you warm while you work. Choose from the rugged functionality of BlakLader workwear, the safety benefits of Tingley Hi Vis clothing, or the stylistic practicality of Dickies work clothing. 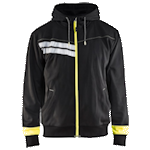 BlakLader’s full zip, hooded sweatshirt is made with 100% cotton to ward off the chill, and the soft cotton fabric offers comfort that is hard to come by in industrial-grade work clothing. You won’t find a better sweatshirt for the value, and the quality of BlakLader clothing has been proven over and over since the brand’s conception in 1959. 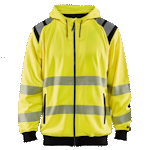 Stay safe on the roads and the jobsite with the Tingley Class 3 High Visibility Hooded Sweatshirt. Available in fluorescent lime and orange, this sweatshirt is made with polyester material and features 2” reflective tape to keep you visible. The single pouch pocket allows you to keep your hands warm, and our WorkWear Quantity Discount applies to this hooded sweatshirt when you are buying in bulk. Take your pick from four high-quality Dickies sweatshirts in our collection: Thermal Lined Fleece Hoodie, Mid-weight Fleece Pullover Hooded Sweatshirt, Heavyweight Quilted Fleece Hoodie. All of these sweat shirts will keep you warm on the coldest days, and the basic design is great for layering.